Striking Chicago public school teachers have a message for Mayor Rahm Emanuel on Tuesday, Sept. 11, 2012. All that helps explain why, when asked if the president had an official reaction to the strike in Obama's very pro-union hometown, White House press secretary Jay Carney basically said, "no." CARNEY: Well, I'm sure he's aware of it. I know he's aware of it. But I haven't spoken with him about it, so I can't speak for his reaction. I can tell you that as a — more broadly, that our principal concern is for the students, and his principal concern is for the students and families who are affected by the situation. And we hope that both sides are able to come together to settle this quickly and in the best interests of Chicago's students." RYAN: "I've known Rahm Emanuel for years. He's a former colleague of mine. Rahm and I have not agreed on every issue or on a lot of issues, but Mayor Emanuel is right today in saying that this teacher's union strike is unnecessary and wrong. We know that Rahm is not going to support our campaign, but on this issue and this day we stand with Mayor Rahm Emanuel." Obama and his Education secretary, Arne Duncan, have embraced reforms that aren't exactly popular with teachers, changes embodied in the president's Race to the Top initiative. The administration's support for using students' standardized test results to evaluate teachers and for the firing of failing teachers haven't endeared him to the members of the National Education Association or the American Federation of Teachers and their members. Those, by the way, are some of the same issues at the heart of the current Chicago dispute. But the disagreements many public-school teachers have with Obama pale compared to those they generally have with Republican politicians, though it's important to remember that many public-school teachers are themselves Republicans. 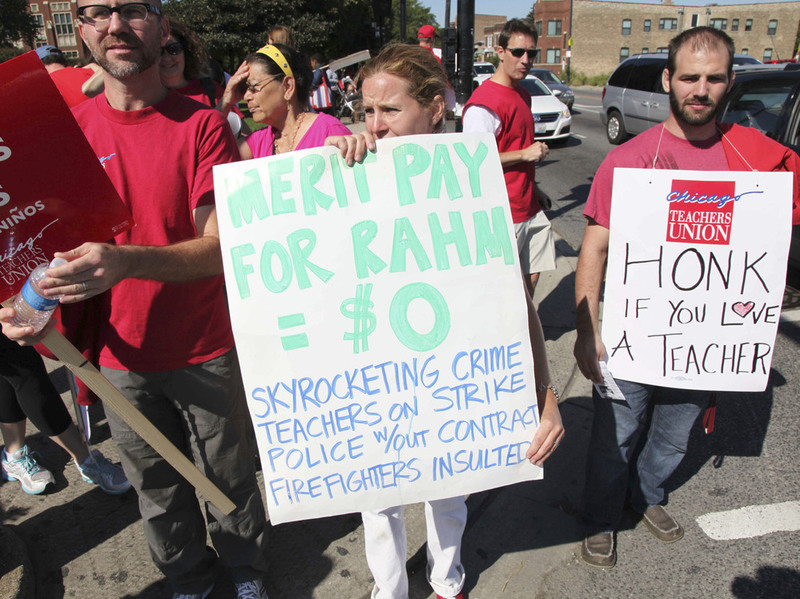 Meanwhile, it's possible that Emanuel's standoff with the teachers could wind up helping Obama by underscoring the very real differences that exist between the teachers unions and the Obamians. On the Political Meaning of "Blue Collar"